A wide-angle lens with enhanced perspective, focus and depth-of-field control. As the wide-angle version of Nikon’s three perspective control (tilt-shift) lenses, the PC-E NIKKOR 24mm f/3.5D ED delivers a dramatic ultra-wide-angle view perfectly suited for architecture, interiors, cityscapes, landscapes and more. Featuring Nikon’s versatile tilt, shift and rotation capabilities, advanced lens technologies, and the superior design and construction that have made NIKKOR lenses famous, the PC-E NIKKOR 24mm f/3.5D ED will expand any photographer’s capabilities and creativity. Nikon’s high performance perspective control lenses let you quickly adjust the focal plane of the lens—independent of your camera position—to bring an entire landscape into sharp focus, to alter the natural depth-of-field of a scene, to selectively focus on certain subjects, to offset perspective anomolies in architectural shooting and more. The PC-E NIKKOR 24mm f/3.5D ED combines that control and a versatilve wide-angle perspective. 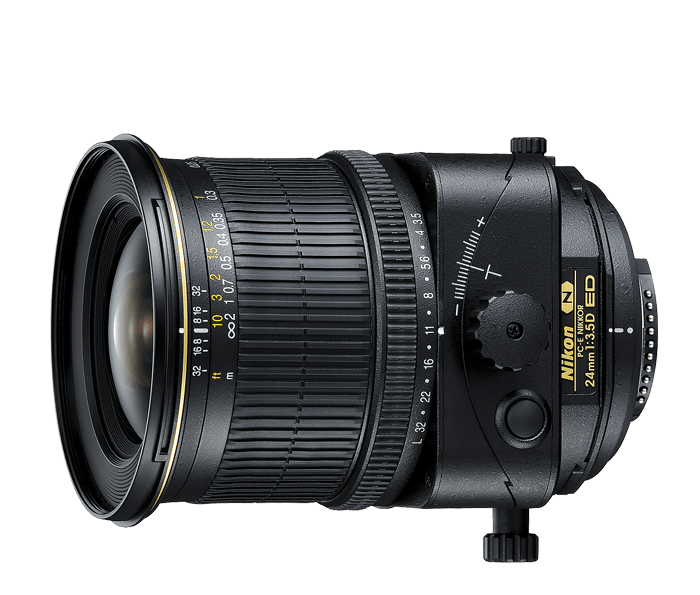 Like all NIKKOR lenses, the PC-E NIKKOR 24mm f/3.5D ED produces truly superior images. Three Extra-low Dispersion (ED) glass elements ensure outstanding sharpness and color reproduction. Nano Crystal Coat (N) virtually eliminates the ghosting and flare often seen in lesser wide-angle lenses, while Aspherical lenses (AS) greatly reduce coma and other types of aberration. And since it’s a Nikon, you can expect the highest standard of lens design and durabliity for years of consistent performance.